As for the previous one, the level and quality of these comments is so high that the thread has become unreadable for non-physicists. Could you eventually, for the sake of not losing the majority of us too much behind, make a quick non-technical summary of what are you discussing? is there any progress or barely nothing? 1) We are exploring the validity of the claims of the different experimenters (NASA in the USA, Shawyer in the UK and Juan Yang in China) by systematically analyzing their experiments. 2) Some of the people in this forum are also designing and working to make their own prototypes and experiments. 3) One of the people in this forum (@NotSoSureOfIt), has made an outstanding contribution by independently deriving an equation that is not far from the claimed experimental results. 4) There are a number of possible physical reasons for the experimental results to be valid for space propulsion as well as for the results to be an experimental artifact that may not produce any propulsion in space. 5) There have been no further reports from NASA on the experiments that were supposed to be replicated at their other centers (JPL and Glenn) or at John Hopkins University. Actually @wembley, who is an aerospace technology reporter, reports that it is his opinion that NASA has a "news blackout" on this matter, and China's Juan Yang is not saying much either. The Chinese seem to be much further along than NASA, as they reported much greater thrust and they have conducted more thorough experiments (including being the first to numerically report the effects of temperature and temperature gradients with thermocouples embedded in the metal). Shawyer in the UK seems to be much further ahead than NASA as he claims he is exploring a superconducting design. Shawyer (UK) made a presentation in Canada late last year where he showed his latest design (using superconductivity) which he claims will result in much greater thrust/PowerInput (see image below). The physics is descrived in vvery different terms ("Leonov’s superunification theory"?? "Antigravity" ) this has similar performance to what Shawyer predicts for a superconducting EmDrive thruster, i.e. 500 to 700 kg for 1kW power input. 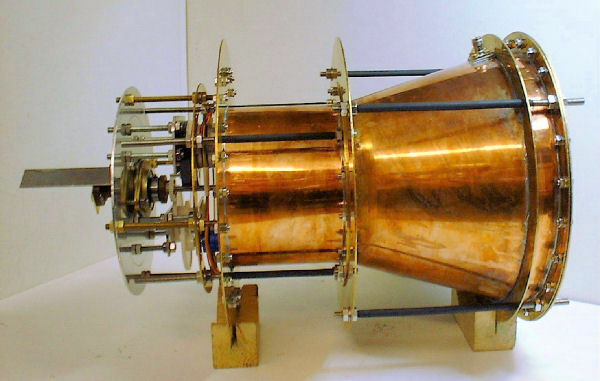 Moreover, as soon as it starts to accelerate, the thrust ceases, hence the pulsed operation in the video, which is what Shawyer claims for a high Q EmDrive thruster without Doppler compensation. What does the team think...? I'm a newbie and not an expert, but I can give my opinion nonetheless: another proposal that needs strong evidence to give it any credence. The material is somewhat scarce on technical details about the posited thruster, except the description of the author's theory. It's not clear for me if this is another version of the Emdrive or something very different. The videos of the moving chariot with inert wheels are interesting, but they can be done with many other things here on Earth, by using friction. Long-time lurker here; I have to thank you all for your tireless contributions with very little data to go on. While it's too early to tell if anything will come of this, the potential payoff is earth-changing. It does appear to me that @wembley is correct and there is indeed a de facto, if not formal, news blackout from NASA. Given the enormous level of interest in this over the last few months, isn't it odd that we haven't seen so much as a terse announcement to the effect of "We decided not to test this further at JPL after all, due to the fact we think it's nonsense, we have budget constraints, etc.". But as far as we know, they have said nothing at all since the initial announcement. For people more familiar with NASA, is that common? Does NASA as a civilian agency have a history (or policy?) of suppressing experimental results that, like this, may have military applications? In other words, can the lack of any news at all one way or the other, be taken as a sign that there might be something to this? Or is that just conspiratorial nonsense? Rockets have military applications, but NASA does not suppress experimental results of rockets. To the contrary, they partner with companies such as SpaceX and share information for the advancement of space exploration. I'm not convinced there is a black out for EM drive technology. There appears to be a delay, which could have many causes. If there are people in the administration advocating for a black out, I think it is a mistake, and probably too late given the amount of information already in the public domain. It is basically a rehash of the statements released in July, but gives some spaceflight context. In this presentation Dr White is very matter of fact about this concept. He seems to leave little doubt on how he feels about the effect's existence. I hope he is right. He talks about some of the mission profiles. But this year we have not heard anything since. It has been nearly 6 months, surely they know yay or nay by now. As some readers have pointed out, perhaps it has gone underground? Or maybe the results are so incredible that no one wants to be the first to report it for fear of ruining their career if they are wrong. If thats the case we just need someone to break the dam. Interesting account relating to the history of Nasa and Darpa involvement with developing/testing advanced propulsion concepts. There is a lot of intriguing reading if you research the history and associations of the people named in the article. To be fair to NASA if this does work it's such a revolutionary technology that the reporting of it is not something to be rushed into. No doubt every result is having to be checked, checked again & then checked again etc etc which no doubt slows down the release of information. Especially if on top of that there are national security implications that have to be considered as well. Also not exactly mainstream news but interesting nonetheless. I only very briefly skimmed over the paper but it has a very amateur feel to it. For example the author claims ``numerical method analysis'' was used. Towards the end of the paper they clarify that they used the software packages HFSS and Analyst under an evaluation license. This does not give me high hopes that they were used correctly. Yes, anything in particular you were after? The Eagleworks Lab is still working on the copper frustum thruster that was reported on last summer at the AIAA/JPC. We have now confirmed that there is a thrust signature in a hard vacuum (~5.0x10^-6 Torr) in both the forward direction, (approx. +50 micro-Newton (uN) with 50W at 1,937.115 MHz), and the reversed direction, (up to -16uN with a failing RF amp), when the thruster is rotated 180 degrees on the torque pendulum. However we continue to fight through RF amplifier failures brought on by having to operate them in a hard vacuum with few $$$ resources to fix them when they break, so the desired data is coming along very slowly. We are still working on obtaining enough data though that will allow us to go to Glenn Research Center (GRC) for a replication effort in the next few months. However that will only happen if we can make the thrust signature large enough since the GRC thrust stand can only measure down to ~50uN, so we have to get the thrust signature up to at least 100uN before we can go to GRC. As to the theoretical side of Q-Thrusters, Dr. White has just developed the first cut at a quantum vacuum (QV) based plasma code written in C+ under Windows/Unix and VMD visualization software that utilizes the COMSOL E&M derived field data for a given thruster geometry that allows one to track the movement and velocity of a subset of the QV's electron/positron neutral plasma pairs in the thruster over time as they respond to the applied time varying RF E&M fields in the copper frustum resonant cavity and to each other. This package also allows one to calculate the expected thrust for a given input power and quality factor of the frustum resonant cavity based of standard plasma rocket physics. So far the estimated thrust verses experimental observations are within 2% for the first experimental data run I compared it to, but we still have a long, long road ahead of us of experimental validation before we have any real confidence in this very new Q-Thruster design tool. Wanted to examine the inventor's theory of operation. We spent a lot of time discussing Shawyer's theory, but Fetta didn't get much discussion. Probably because his paper is paywalled. Also @Wembley, thanks for the patents. There's plenty of free info there. Found these puppies. Emailed the seller to see what the dimensions are and to see if they are the manufacturer and whether they do custom sizes. Might be cheaper and less headache than buying a copper sheet. Something very nice about the exact solution I obtained for the frequencies and mode shapes of a truncated cone, or for a cone, is that it implicitly, automatically, incorporates the condition of cutoff frequencies. The exact solution for a cylinder in Wikipedia (http://en.wikipedia.org/wiki/Microwave_cavity#Cylindrical_cavity) does not explicitly refer to the need for the condition of cutoff frequencies, and therefore the cutoff frequency condition (http://en.wikipedia.org/wiki/Cutoff_frequency ) has to be included in (http://en.wikipedia.org/wiki/Microwave_cavity#Cylindrical_cavity) as an additional condition (which we did not do in previous discussions of mode shapes: some of the mode shapes we discussed for certain geometries do not have Q resonance because they are cutoff ! ). Not all values of the longitudinal mode shape quantum number "p"=0,1,2,3,... are allowed. Low values of "p" (starting with p=0) are disallowed by the cutoff condition for small diameters. This has very important consequences for a truncated cone, because as the small Diameter approaches zero, the cutoff frequency approaches infinity. This means that for a pointy cone, there can be no resonant Q solution possible. A pointy cone can only have evanescent waves (since only real solutions to the eigenvalue equation are standing-wave resonant Q solutions, and the complex value solutions to the eigenvalue equation are evanescent waves). Since the Xfunction increases with m and n (except for one particular X' value for the TE mode with m=1: X'1n or TE1n) , small diameters cut off frequencies such that the mn modes can only occur at higher p values, that's why @aero found that the longitudinal mode shape quantum number p=3 for the NASA truncated cone with the dielectric, instead of p=0 or p=1 or p=2. The higher the value of the dielectric constant epsilonr (everything else held constant), the lower the frequency will be for a given mode shape mnp. This clearly shows the function of the dielectric in the EM Drive: the dielectric allows mode shapes to occur at frequencies that would otherwise be cutoff for a given geometry. The dielectric allows mode shapes to occur for smaller values of the small diameter. Also, the cutoff frequency condition clearly shows why NASA and Shawyer located the dielectric at the small end of the cavity, since the cutoff frequency is a function of the the dielectric constant, such that lower dielectric constant allows for lower cutoff frequencies or equivalently smaller diameters. The best place to put the dielectric is at the small diameter in order to allow mode shapes to occur that would otherwise be precluded because of the cutoff frequency condition. It is very interesting that there is a "sweet spot" of geometries for these EM Drives: too large a diameter leads to too many mode shapes very close to each other (and hence very difficult to tune and keep the EM Drive at a given resonant frequency) while too small diameters lead to cutoff of mode shapes. A pointy cone cannot have Q resonant modes, a pointy cone can only have evanescent waves. The closest one can come up to a pointy cone Q resonance would be to calculate and design a geometry with a dielectric located at the small end and a small but finite Dsmall diameter. Dsmall must be greater than zero, and for practical solutions this implies a minimum diameter. 1.17 times the "a" dimension of a rectangular waveguide." I've set the small diameter as 1 wavelength for the top cone. The bottom was set from calculating cylinders, so the guide wavelength in diameter is different than multiples of .5. See previous post. The whole point of this exercise is to calculate the diameter of the "blanks" to insert into a cone of X angle and be resonant at the desired frequency and mode. I'm trying to figure this out by holding the small diameter as a constant. @ Paul March, thank you for chiming in. All of us are chomping at the bit for ANY news whatsoever. Maybe Eagleworks could leverage its social media presence (https://www.facebook.com/eagleworksnasa) to keep the public engaged. As far as the lack of $$$ and resources go, I understand that Eagleworks works on a shoestring budget. Wish we could help. It probably isn't acceptable for us to try and crowdfund a government agency. Hopefully you achieve results that will turn heads. Godspeed. In theory, could a dialectric be used to suppress resonance modes that might otherwise be present in an over-sized cavity? Got a supplier! They will do custom sizes and have their own shop. What they make is far superior than what I could slap together. "apx. dimensions small= 6 5/8" x 3 3/8" medium= 8" x 5" large=11" x 7 3/4" all are 7 3/4" tall . yes we do make them @ our sheet metal shop & sure we can make custom sizes. Thanks Rick"
Thanks Paul for an excellent update, much appreciated. Congratulations to the Eagleworks team for obtaining experimental force measurements in the torsional pendulum in a hard vacuum (~5.0x10^-6 Torr) ! It would be most helpful to the scientific/technical community if you could provide the dimensions of the frustum of a cone (truncated cone) used in the Brady et.al. "Anomalous ..." report. It would be most helpful if you could provide the actual (internal) dimensions of the frustum (or at least if you could provide its approximate dimensions). The dielectric reduces the frequencies at which resonance occurs, so it helps to avoid cutoff of mode shapes, and therefore there are more mode shapes with the dielectric (looking at all frequencies) if the relative permittivity > 1. Looking at all frequencies, if a given geometry has mode shapes cut off without the dielectric, the inclusion of a dielectric can bring some of the mode shapes back. This is only possible within the available material properties, for example for polymers, it reduces the frequencies (compared to the ones in air) by a factor of Sqrt[2.3] = 1.52. From the list below, Neoprene Rubber seems to have the highest dielectric constant of the solid materials in the list, it appears that Neoprene Rubber may reduce frequencies by a factor of Sqrt=2.45. The liquids seem to have much higher dielectric constants. The Wikipedia list ( See http://en.wikipedia.org/wiki/Relative_permittivity for a list of relative permittivites.) has listed "Calcium copper titanate" as having a dielectric constant of > 250,000 ! which would imply a factor of Sqrt=500 times !. It gives this link ( http://oatao.univ-toulouse.fr/698/1/boulos_698.pdf ) that describes this multi-phase ceramic material. To supress resonant modes (as compared to air or vacuum) one would need a dielectric with a relative permittivity less than one (resulting in an equivalent speed of light in the medium greater than the speed of light in vacuum "c" ). "The cutoff wavelength for the dominant mode TE11 of a circular guide is 1.71 times the diameter of the waveguide." The dominant mode of a circular waveguide or cavity is the mode with the lowest value of Xfunction. This corresponds to X'11 which has a value of X'11 = 1.84118 (see: http://wwwal.kuicr.kyoto-u.ac.jp/www/accelerator/a4/besselroot.htmlx ) . Therefore the dominant mode is TE11. "The cutoff wavelength for the dominant mode TE11 of a truncated cone cavity is 1.71 times the small diameter of the truncated cone." What do you think @Rodal? Do we have enough to confidently calculate a frustum of a cone that works and will fit within a 12"x12" sheet? The cylinder fits at least. I'm quite happy staying with 2.45ghz, TE111 for now. I don't care about finding the best mode for max thrust, just any thrust. My main concern is being able to tune the EM Drive cavity to achieve Q resonance in the experiment. Based on NASA's results I think that only the TE modes should provide a force measurement. I don't think that the TM modes will provide a force measurement. As you know, the magnetron is not going to exactly deliver the nominal frequency of 2.45Ghz, and geometry imperfections are going to affect the natural frequency so that it will be different than the natural frequency of a perfect geometrical cone. Shawyer for the Demo had and adjustable end at the small end of the truncated cone that allowed him to mechanically tune the resonant, natural frequency of the drive (to match his nominal 2.45GHz excitation frequency).